I liked Kirby's Canvass Curse on the DS and used to play it a lot. We got a DS just after they came out, it was the big chunky one and the game we got with it was Canvass Curse. It was a neat game because you could draw lines where you wanted Kirby to go. My older brother got a 3DS a few months ago and has been looking forward to new games on that. I thought that meant that all the best games would come out for that now rather than the old DS that I have. 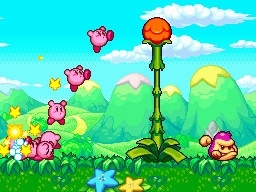 But then I played Kirby Mass Attack and was really excited to see that good games were still being made for the DS. It's funny actually, because since getting the 3DS my family (my dad mainly) has been playing more on our old DS than the new 3DS. He's been playing two games that have dogs in them Okamiden and Solatorobo and says they are really good adventure games. 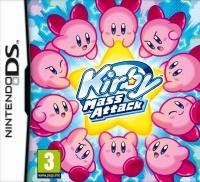 Kirby Mass Attack looks like the old platform games my older brother used to play on his black and white Gameboy. It also sounds like it a bit too with the music that beeps and bops as you play. But to play the game is different. You control a little flock of Kirbys by touching the screen with your stylus. 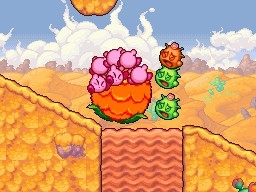 This puts a star on the ground for the Kirbys to follow, so when you drag it around they move along the level. 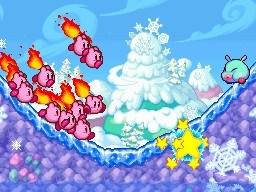 You can also flick the little Kirbys at things so they fly through the air. 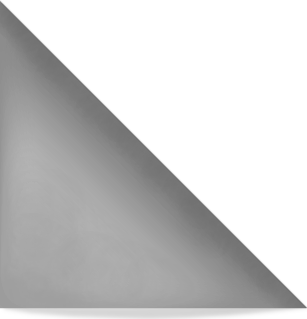 Last of all you can group them together and then draw a line to float them through the air. I like it because it makes sense. 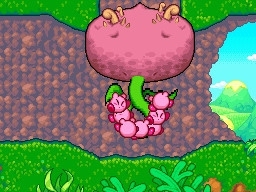 You just tap where you want them to go and they follow or tap on an enemy fruit thing and they attack it. 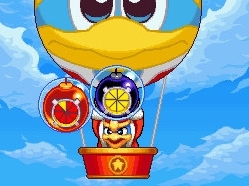 The minigames in Mass Attack are like whole other games. 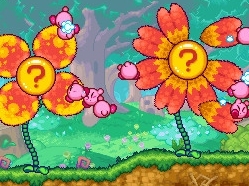 Best of all is that you can collect up to 10 Kirbys in the game. You collect fruit and full up a fruit bar. When it's full you get a new Kirby. The more little Kirbys you have on a level the more things you can do. Sometimes you need more to start a level or sometimes you need a certain number to push down a switch. I like running my Kirbys through the level as fast as I can. You can double tap on the screen to make them move faster. My brother does it differently though. He tries to collect every coin and piece of fruit. If you get through without a Kirby dying you get a Bronze medal and if you get through without one getting hurt you get Silver. Do it all perfectly for a Gold I think. I found the early levels quite easy, and I thought it was good that it doesn't get harder too quickly. With me and my brother playing we soon had a big collection of coins. This means you can unlock other Kirby games. I don't usually like these extra minigames as they are too simple or not much fun. But the minigames you get in Mass Attack are like whole other games on their own. There is a really fun Kirby Pinball game which was just like my brother's Gameboy Kirby Pinball Land game. And there is a Find Kirby game that is like where's Wally. 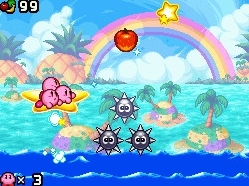 Playing Kirby reminded me of watching my brother play other old games like Rainbow Islands or Bubble Bobble. If you poke around a bit there are lots of hidden things to find. I guess it's a little bit like New Super Mario Land too, but because it's faster and quicker to play I think it's more fun than the Mario games - I can never get the jumping on things right. 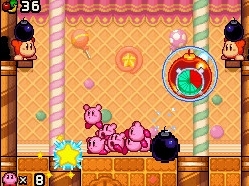 Kirby Mass Attack is great for younger players. Kirby Mass Attack is great for younger players like me I think. It's just as easy as Pac 'n Roll and Electroplankton and it's much more like a proper game. It must also be good for older players too because the rest of my family are also playing it a lot.